Just a note, I am writing this three weeks after the race. For some reason I just haven’t found the motivation to write out a report for this one despite writing up a report for this past Saturday’s road race the same day. I think this pretty much epitomizes my attitude towards structure in regards to trails and why I am beginning to love them so much. Props go to my trail running partner-in-crime, Stinkfoot & Chafe, for encouraging me (read: harassing me) into doing this race. 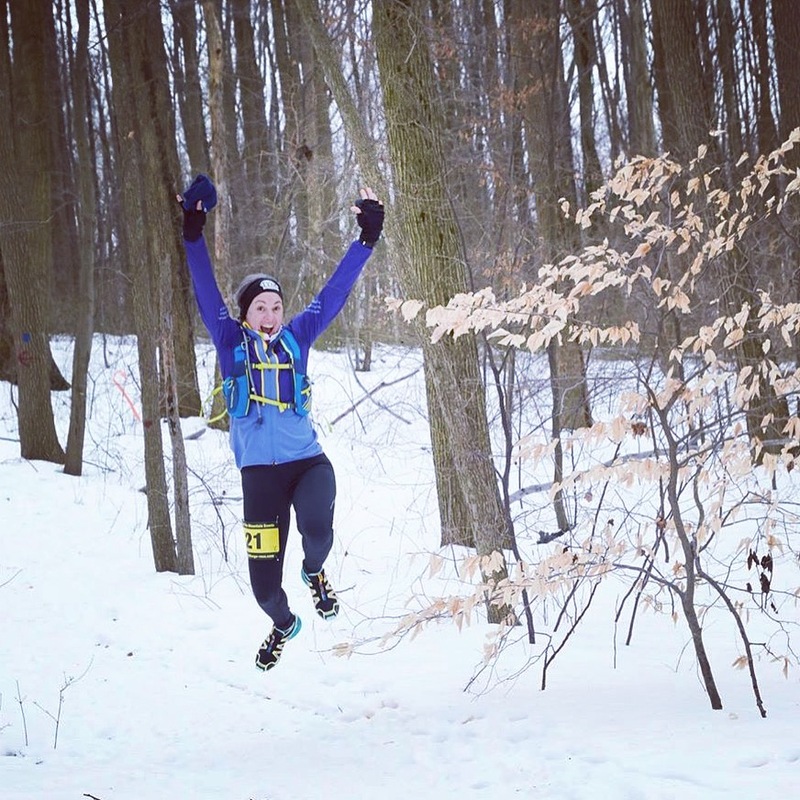 At the time of registration, I had been on exactly one real trail run in the snow which happened two weeks prior and was as challenging as it was fun. 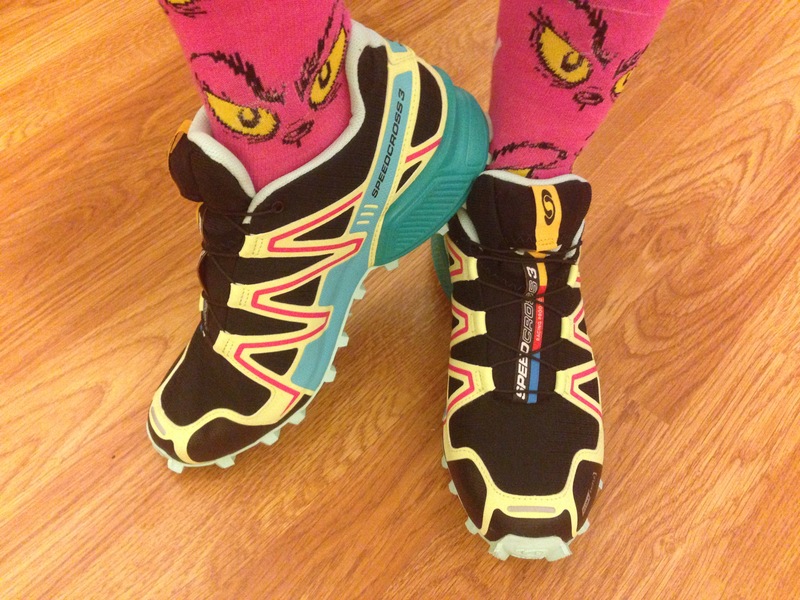 I was reluctant to toe the line so early in my trail career (haha, I said career), but after viewing an entertaining video of the course about 10 times and ordering some legit trail shoes I decided I was in. My shoes arrived the day before the race after yet another eventful couple of days trying to actually receive my delivery (#nycproblems) and I was worried that they were going to be a little too big. Other than that, I felt pretty prepared for the 20 degree (12 with wind chill!) 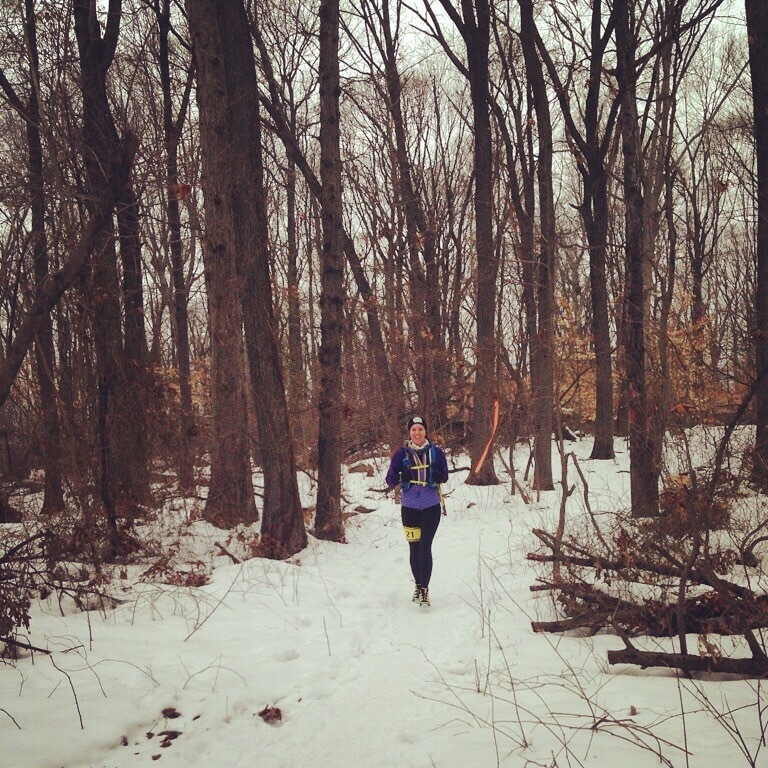 run in fresh snow. New trail shoes! Unfortunate that the turned out to be a full size too big. Anyone need a Women’s size 8? The course was just off a golf course on Staten Island. We got there early so we could pick up our bibs and swag (fleece cap and NUTELLA!) and make a pit stop at the clubhouse. 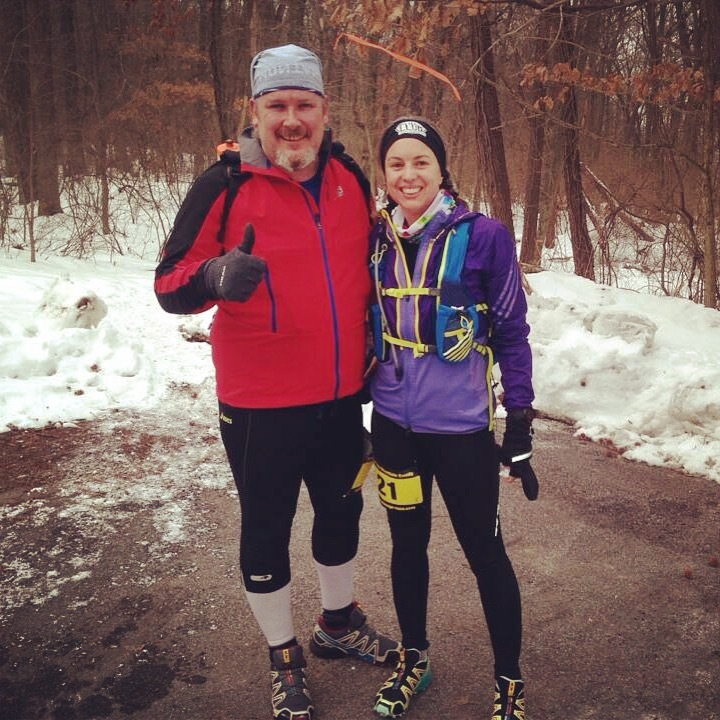 The one thing I really hate about winter races is how cold you are in the corrals at the start so I was very happy that we were able to hang out in the clubhouse until just before the start. We made friends with an older fellow who told us lots of interesting history about golf courses on Staten Island. When they announced five minutes to start we started out towards the start line for a course description and then wandered over to the start. No corrals, no colors or numbers dictating pace, just line up and then head out. In less than a minute, we had left the signs of civilization behind for the of the snowy woods. Swag score! 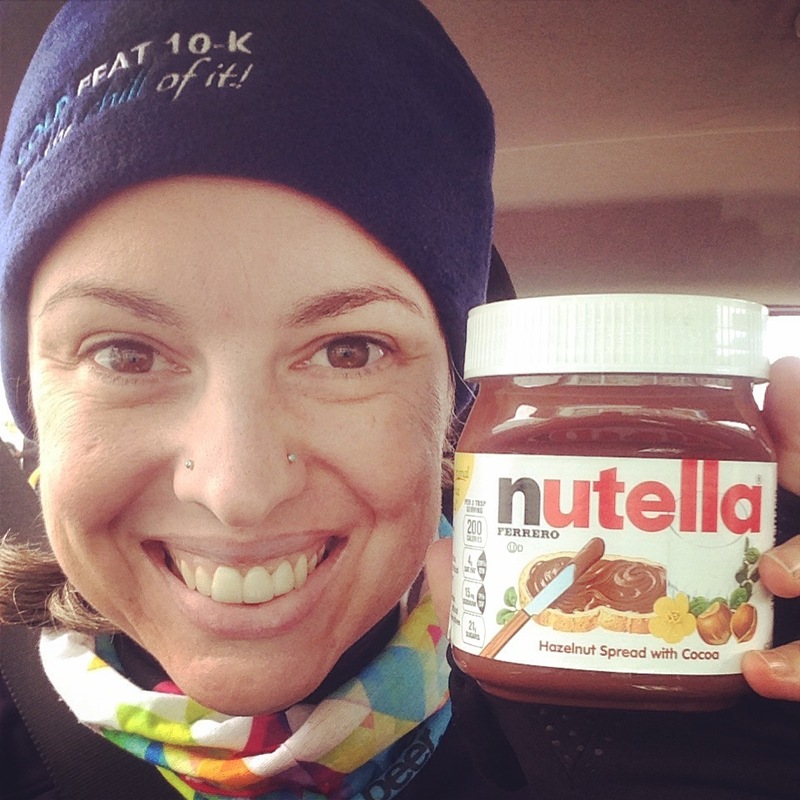 Embroidered fleece hat AND a jar of Nutella?! This is my kind of race! The course was great. It was fairly packed single track and we had placed ourselves fairly well in the pack so not only were we not getting passed, but we didn’t do much passing throughout the duration of the race. Stinkfoot and I stayed pretty close throughout the course with him getting away from a few times which was expected as he is a faster runner. We eventually ended up behind an older gentleman who I nicknamed “Crazy Tights” because of his graphic print tights. We had picked up another in our small pack, a woman who easily and readily added to my and Stinkfoots meandering convo. At a certain point we all needed to pass Crazy Tights which became interesting as I think he may have been hard of hearing. This was made evident when overly excited snowshoer almost ran him over after making all kinds of witty remarks for him to move on his approach. I ended up finding a little run-off single track and we passed him without incident. Approaching the half mark and only aid station, I knew I needed to do three things: Tighten my shoes, blow my nose, and eat a Honey Stinger. The aid station volunteers were super nice and luckily one of them had a tissue. She was kind enough to not only give me one, but shove a spare in my hydration vest while I fiddled with my laces. We continued our pause with a quick photo and Honey Stinger then started back on the course. It was around this time that I noticed that my water had was starting to freeze in my hydration pack tube! I tried to keep sipping regularly so it wouldn’t freeze completely. Looking good at the halfway point! The second half of the race seemed more challenging than the first. 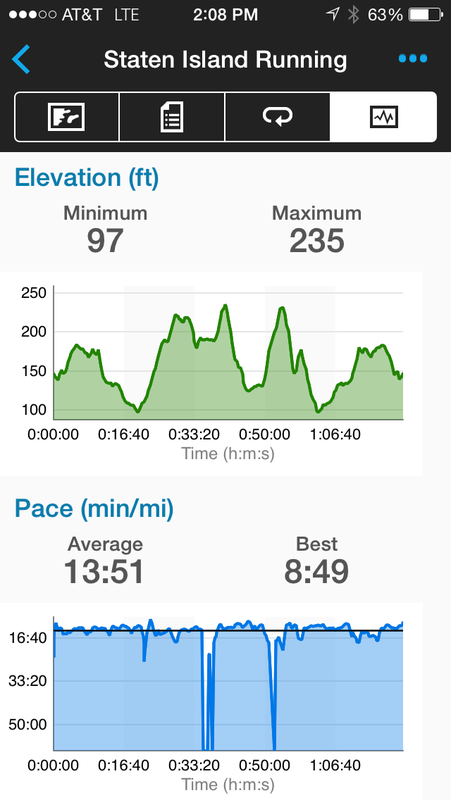 The elevation profile didn’t change much, we picked up the pace by about a minute and my heart rate followed. By the time we got to 5 miles, I was feeling it but pushed through. We managed to pass a few people in the last mile or so of the race which felt oddly satisfying. By the time we got to the final stretch and saw our exit from the woods I was ready for the end, but also bummed it was almost over. The last stretch of the course was covered with patches of ice which made for a pretty anti-climatic finish excluding the man in a gorilla suit that was cheering us on and the other runners who were hanging out in the cold to cheer us in. After our finish we returned the favor for a few more runners. The finish was the same as the start so we were back by the clubhouse which was awesome. We were able to grab our bags from the car and get some warm gear on and have a beer in the clubhouse! After the beer we headed for our now traditional post-trail run diner breakfast. Hot food after a long, cold run is so amazing! I ended up placing 7th in my age group out of 17th which translates to front half of pack which I have never been! 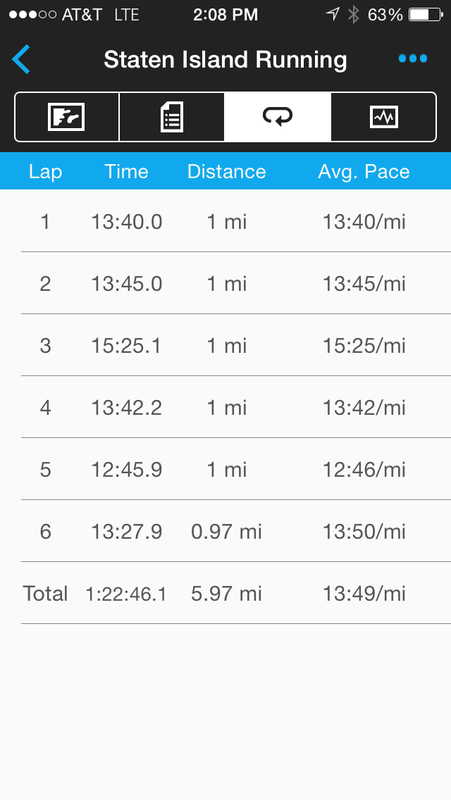 Not bad for my trail race debut, if I do say so myself. But it’s not about placing or pace for me and it never has been. And that is part of the reason why I feel myself enjoying road racing less and less. It is awesome to do a supported, uninterrupted run in which I push myself for no other reason than to check my training progress, but all that goes along with that–the cost, the crowds (oh dear lord, the crowds), the PR-driven post-race chatter, all of it–is just so unappealing to me. My heart feels free and happy on the trails and the community is so, so wonderful. My “A” race for this year is the NYC Marathon so I will continue to focus on road through 2015, but I fully intend to keep sneaking out to the trails whenever possible! Next postI’m a legit mutant. Where are my superpowers?